Modular belts are constructed with modules molded from thermoplastic materials connected with soild plastic rods. Except for narrow belts (one complete module or less in width),all are built with the joints between modules staggered with those of adjacent rows in a "bricklayed" fashion. This structure can enhance transverse strength and it is easy for maintain. The total plastic and cleanable design can solve the steel belts easily polluted.Now the cleanable design makes the belts very suitable for food industry area as well.Also there are be widely used in many other industries,such as container making,pharmaceutical and automotive,lines of battery and so on. Flat Top:suitable for a wide range of products,when a fully closed belt surface is preferred. 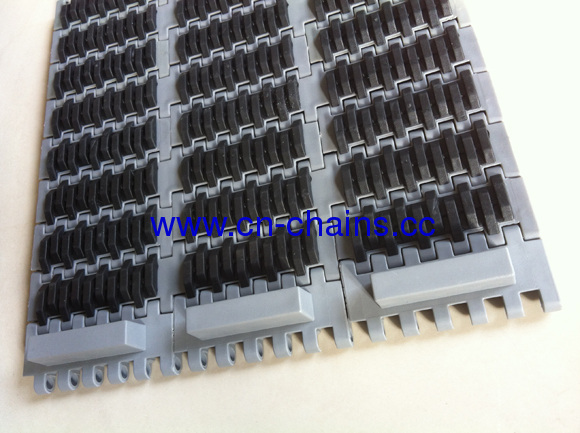 Flush Grid:commonly used in applications where drainage or airflow is desired. Raised Rib:recommended in applications where product stability over transfers is a concern. Friction Top:commonly employed on incline conveyors, where the elevation of product changes.Friction Top modular belts can be used up to an angle of 20 degrees,depending on the pack style and material. Roller Top:used in a variety of low-pressure accumulation applications. 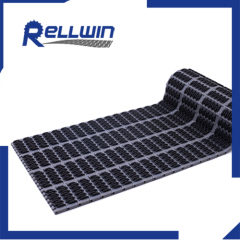 Perforated Flat Top:used when air flow and water flow are critical but the percentage of belt open area must remain low. Other,less frequently used belt styles may better fit your special requirements:Open Grid,Nub Top(anti-stick),Cone Top(extra grip).